I roll my eyes whenever a news article states that inflation has remained mostly stable. The consumer price index that’s usually referenced doesn’t account for the cost of food and fuel. What kind of an indicator is that? Fuel and food costs, especially the price of beef, have more then doubled over the past few years. As a result, many people have had to make hard decisions. The cost of prized beef like tenderloin/filet, ribeye/prime rib, and top loin/strip has always been high. As peasants found ways to make the cheaper cuts taste deliciously tender, increased demand inflated the cost of those cuts as well. I’ve been trying to find the sweet spot between price and popularity. I eventually settled on what I think are the six most economical steaks that don’t sacrifice high quality for low cost. Buying these cuts will allow you to keep steaks in the weekly rotation without breaking the bank. The IMPS/NAMP classification is the code you can give your butcher if he/she’s not sure which cut you’re talking about and needs to order it. This is a 2-3 pound muscle from the chuck area of the cow. It’s about the same size and shape as a pork tenderloin. It’s basically a poor man’s filet mignon. If you’re just feeding 4 people, you can actually use it to make a miniature version of beef wellington. You’ll probably have to call ahead to tell the butcher you want a whole shoulder tender. They usually slice it into butterflied steaks to increase their surface area. It’s very lean, so it will dry out and lose flavor the longer it cooks. Of all the steaks on this list, this one can be cooked the closest to well-done without becoming tough. Not that I’m advocating that, but it is possible. This steak is not to be confused with “mock tender,” which comes from the chuck area and isn’t very tender at all. This is a flat, triangular-shaped cut of meat from the top sirloin area of the cow. It’s the signature steak that’s served on long skewers at Brazilian churrascarias with a little of the cap (fat) left on. It looks kind of like a miniature brisket that weighs between 1½-2½ pounds. The fat in the cap crisps up like bacon and marinates the meat as it melts. You’ll probably have to call ahead to tell the butcher to separate it for you. Don’t cook it past medium. This big, triangular muscle is usually sold intact as a roast or pre-cut into steaks. Top sirloin cap steak and tri-tip are often confused, so I should point out that true tri-tip steak comes from the bottom sirloin area of the cow. Untrimmed, it weighs around 5 pounds. It’s relatively lean, but it’s tough enough that you’re better off cutting against the grain, which can be difficult because of the odd shape. Don’t cook it past medium. This is a flat steak cut from the shoulder/chuck area of the cow. The whole thing usually weighs between 2-3 pounds, but it’s often cut into two thinner steaks (bisected by a layer of gristle) that make for faster cooking. This is basically a three-minute steak. Don’t cook it past medium-rare and it helps to cut it against the grain. This is a flat cut that comes from the abdominal muscles of the cow below the bottom sirloin. It’s a relatively tough cut of meat that is often tenderized physically or with acidic marinades. The average steak weighs between 1-1½ pounds. Don’t just buy a “London Broil” and think you’re getting flank steak. It’s often mislabeled as a London Broil, but so are many other, tougher cuts of meat (usually top round). London Broil mainly refers to a generic braising roast. While true flank steak can be braised, I cook mine quickly over direct heat with a rub and sauce. Don’t cook it past medium-rare and be sure to cut against the grain. This steak (as well as skirt steak below) really shrinks when cooking, so be aware of that before you try to feed four people with one steak. This is a series of steaks cut from the plate area below the cow’s ribs. There are inside and outside cuts, but the main difference seems to be that the inside steaks are better trimmed. I think they taste the same. You can usually buy them in pre-cut steaks that each weigh around 1 pound. Demand for skirt and flank steak has risen with the popularity of Latin cuisine. If you’ve ever had really tender fajitas, they were probably made with one of these steaks. As a result, the price has been inching up. Still, it’s a good amount of beef for the money and it can be cooked in a flash. This cut really should be marinaded with some mixture of salt and citric acid to break down the fibers before cooking. As with flank steak above, don’t cook it past medium-rare and be sure to slice against the grain. I’ve developed my own way of cooking steaks over the years. I can get a bit methodical when trying to improve a project or a process. Split-testing is part of my day job, so I guess it’s only natural that those techniques have migrated into my cooking as well. The steps listed below arose from my desire to prepare different steaks to the exact same doneness with consistent reliability. I first trim and salt my steaks with a few pinches of kosher salt. The salt extracts moisture out of the meat, which dissolves the salt. Then the salty water is absorbed back into the meat. This is essential for enhancing flavor and tenderness. If I buy my steaks early, I might ‘dry age’ them in the fridge for a few days in loose-fitting foil packets with air holes poked all around. This allows a small percentage of the moisture to evaporate out of the steaks, thereby enhancing flavor and tenderizing the meat even more. This step is entirely optional. About an hour before the meal, I take the steaks out of the fridge and allow them to come to room temperature. Even if I had just bought the steaks at the store, I’d still salt them for an hour at room temperature and then pat them dry if necessary. When I’m ready to cook the steaks, I press some more kosher salt and coarse-ground black pepper into the meat and coat with a tiny bit of oil (canola, peanut, sunflower, olive, etc.). No matter how I cook my steaks, I first sear both sides with high, direct heat for a few minutes to develop a crust. After that, I move them to indirect heat. While the steaks are cooking over indirect heat, I–and this might sound a little weird–fill the bottom of a dinner plate with water and microwave it for 1 minute. I just want the ceramic to heat up and retain a little warmth. When the steaks hit the proper internal temperature (measured to the exact degree with an electric thermometer), I wipe the heated plate dry and set the steaks on it. I top each one with a little pat of butter and cover the plate with foil. Then I let the meat rest for 10 minutes. During this time, the steaks continue to cook and the blood redistributes evenly. I know this sounds like an overly-complicated process to char a piece of meat, but it’s not really a lot of work. These little extra steps make a big difference. The reward is perfectly cooked steaks that have a large, pink center and a robust beef flavor. This post has taken off on Pinterest and I’ve gotten all kinds of emails. One question I get a lot is about the knife and cutting board I use. I’m actually a pretty simple man. 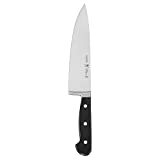 My go-to knife (you really don’t need a lot of knives) is a standard 8-inch chef’s knife from J.A. Henkels. As long as you hone it frequently and sharpen it a couple of times per year, it will keep its edge and last forever. 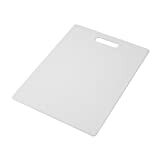 As for cutting boards, I have a few plastic boards that are easy on the knife edge, they’re anti-microbial, and they’re dishwasher-safe. I don’t use wood because of the chore of keeping it clean and treated, and I would never subject my knife edge to glass. Just place a towel under the board and it won’t go anywhere. Toss it in the dishwasher after cutting chicken and let the hot water sterilize it. I’ve gotten some emails about this, so let me address it—skirt steak is not the same thing as hanger steak (IMPS/NAMP 140), although they look, cook, and taste very similar. More here. Flat Iron steaks are Resturant /butcher cuts. Many butchers will not sell this cut to the public and will not make it affordable even if it comes off the.